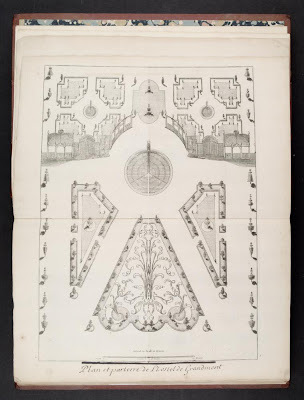 The garden depicted in the wallpaper of the previous post is classically French...compare it to the above illustration from Plans et dessins nouveaux du jardinage by Michel le Bouteaux, c. 1700. Note that there is plenty of 'path', but no 'lawn'...these gardens were for strolling. In enormous hooped skirts and towering wigs. In groups with people similarly attired. Wide paths were a must, and one didn't stray into the grass in high heeled silk shoes.